The Club was started in the late 1980s by a few enthusiasts who wanted a club just for MGs. The founder members were Geoff Bennett, Holt and Webb and Maurice Edwards (Chairman) Pam Watson Jones and Peter Mason joined shortly after. The meeting were held in The Castle pub in Llysfaen which was not considered a safe area for such precious cars hence the move to The Castle Hotel in Llandudno where only a jazz band intruded on meeting. The venue for meeting again had to be changed as the Llandudno hotel was closing and after a great deal of research “Taylors” in Colwyn Heights was booked. The room was excellent and often meals were taken in the restaurant. However new owners were not in favour of organisations having meeting there, so we were homeless again. A few meeting were held in the Estuary pub in Glan Conwy but once again circumstances came into play and another meeting room had to be found, this and to date the Cricket Club in Rhos-on-Sea, where drinks, food and parking space suit everyone. The Octagon Club members joined club runs when suitable for their beautiful cars (1930-40s) and the dress code of the owners suited the era, lots of leather and goggles. A constitution was deemed necessary to deal with membership problems and also laid down the aims of the club. A calendar of runs was presented shortly after the AGM and gave members the chance to organise their year. Sunday runs at least twice monthly, always involving picnics whatever the weather, along with Wednesday evening runs and meal, were a regular feature. The Club joined several other clubs’ runs and they proved to be very successful bringing in new members. The Arden, Cumbrian, Potteries, Jersey and Pendle, to name but a few. As these runs were so enjoyed it was decided to organise a run just for the Club, this resulted in a trip to Ireland. It was so well organised with great hotels and places to visit and glorious weather, that it became the start of similar club runs, all of which have been very successful. A trip to France tested members right hand driving skills but all enjoyed the challenge. We needed to be recognised as a club so everyone bought polo or sweatshirts in green then changed to blue with MG logos, which looked very smart when out and about. Debates took place regarding the word “Classic” and whether to exclude modern cars from the club. They certainly didn’t want to go slowly and along tracks with grass down the middle! Sense prevailed however as many members had both types of cars and could be persuaded to take risks now and again and go off road!! The dedication and friendliness of members to organise runs, holidays, charity everts etc. was without doubt the backbone of the club. Lovely barbecues and parties were often held in members houses and gardens and no car was allowed to have a problem. Heads and tools were often under bonnets with follow ups at home in order to prevent garage expenses and to get the cars quickly back on the road. In 1994 it was proposed by Geoff Holt that a run for charity be organised. He and Beryl had joined other runs i.e. Kimber and Red Rose and thought North Wales could be “put on the map” in a similar way. He had lost a close friend to leukaemia and wanted to do something to help fight this disease. The proposal was not accepted as it was thought to be too ambitious and not enough funding was available. Geoff and Beryl were determined the run should take place so they financed it themselves. Following much advertising and requests for raffle prizes 62 MGs from all over the UK and one from Switzerland took part and raised over £700 for Ysbyty Gwynedd Leukaemia Research Department. The run started at Bodelwydden Castle and finished at Penrhyn Castle. A celebration cake had been provided by Edward Pennant (owner of the castle). Although wonderfully supported in ever way club management was not supportive and for a second year Geoff and Beryl with a few stalwart members arranged another run and financed it again themselves. After a few years of struggle to fund the Snowdon Run, the club finally took it on board and now instead of £3000 for several years work this amount is raised annually. Thousands of pounds have been raised and often given to charities and hospitals in memory of our own members. Numbers of entries have been extended and now exceed 200. The Snowdon Run has become one of the most popular runs in the National MG calendar. It was the chairman’s privilege to wave all the cars off from the promenade with the Welsh flag. The offices had to work hard to keep up with all the entries as all was done by phone and handwritten forms for information. Pin badges were given out and then a change to slate coasters with dates and pictures were given on completion. Due to cost the return to badges was decided upon. The tenth and twentieth anniversaries were celebrated with dinners at the Semaphore and Sandringham (lily) hotels with special cakes provided by members. The finishing venues were often National Trust properties: Plas Newydd , Bodnant and Penhryn Castle, Bodelwydden Castle and Llangollen Eisteddfod field were happy to accommodate our cars. As the club ages so the ages of members joining are now much older than in the beginning, where most people were working and were full of adventurous spirits. Maps were the order of the day, no satnavs or mobile phones, getting off road and stopping wherever was fancied was part of the fun. Times change and volunteers for organisations are getting harder to find, especially to fill official positions. It is hoped therefore that the club can be as successful in the future as it has been in the past. 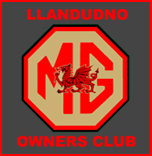 The history of this particular M.G Car run dates back to 1994 and was the result of an idea put forward to the then Chairman, the late Maurice Edwards by Geoff Holt at a meeting held in those days at the North Western Hotel. Geoff’s idea for the run was in many ways an attempt to follow the pattern of other National M.G. runs, The Kimber Birthday Run, which toured the beautiful Derby countryside, The Red Rose Run which chose to tour the lesser known areas of northern Lancashire, and others of a similar nature and intent. Geoff along with his wife Beryl had for many years enjoyed these outings in their T.D. midget and later in their M.G.B. and thought it was time that the magnificence and grandeur of the Welsh countryside and mountains were put on the map by arranging what turned out to be the Snowdon Run. The idea was put to the club ,but was turned down on the basis of being too ambitious and something the club could not afford finance. Now Geoff and Beryl were not going to back down on this idea so there was only one answer to the problem, they would finance the entire arrangements by themselves. The necessary authorities were contacted for their approval, many businesses donated to the organised raffle and following the invitation in the magazines the great day arrived to find 62 M.G. Cars of all types gathered in the lower car park at Bodelwydden Castle for the start of the first Snowdon Run. The journey took in some 90 miles of hills, valley and mountains to finish in the grounds of Penrhyn Castle. It was an immediate success from all angles, the proceeds from the entries and the excellently supported raffle resulted in £700 being handed to Yabyty Gwynedd in support of the Leukaemia Research Department. This apparent success however did not wholly register with the club management and so it again rested on the shoulders of Beryl and Geoff Holt to go it alone and with thankful support of a few stalwart members the Snowdon Run became an established annual event. Subsequent runs were arranged to start on the promenade at Llandudno when a limit of 150 cars was enforced by the authorities, the finish was arranged to take place at Plas Newydd on Anglesey. Ever with the invaluable help of those few keen members of the club the financing and organising was becoming more difficult and an appeal for the club to takeover the complete organising and financing was unfortunately not forthcoming. As a direct contrast the popularity of this now well established National run was proving ever more intense and on the 1997 run Beryl and Geoff reluctantly closed the entry list at the regulation 150 cars which meant that an over subscribed number of 31 cars were refused. The Snowdon Run for M.G. cars is probably one of the most picturesque of all the similar everts which are organised by enthusiasts in the UK. The Welsh countryside lends itself as no other can to the pleasure and enjoyment of the entrants where their pride and joy can by displayed just as Cecil Kimber intended. It was ironic that during the year of the second run in 1995 Beryl was treated successfully for breast cancer which made the efforts all the more pertinent. Geoff is at present undergoing treatment for prostrate cancer.